Photos from last year's book sale. Acceptable Items can be dropped off at the library circulation desk. Please do not put items in the book drop. The last day to donate items to the Friends is Sunday, September 8, 2019. Thank you for your help and your donations! 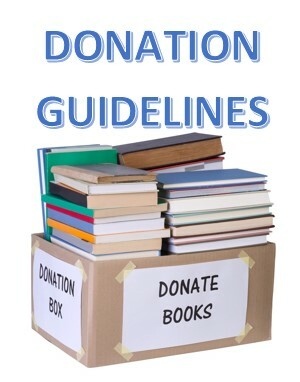 If your books are NOT in a condition to be reused or sold contact these alternative places to see if they will accept what you have and what fees might be involved.